Drama creates a sense of personal involvement and ownership that facilitates effective learning. Finding Maths puzzles and investigations for groups to share is not difficult. There are many to be found on children's Mathematics sites on the net or in books. I offer a few of my own on this site and will recommend some useful sites on the links page. Presenting them in a creative and imaginative manner is real added value. Drama can help you here. 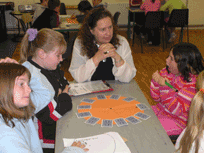 We run a workshop that combines Maths and Magic where we help children to present maths puzzles as if they were magic tricks. Indeed many of these puzzles do look like magic tricks until you understand what is going on. The magic here is in the presentation. Groups prepare their puzzle or investigation and choose a dramatic way to present it. 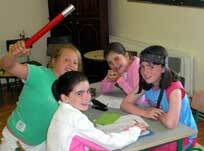 The group may choose a name for themselves "The Mathmagicians" for example. They may make costumes or props to help them. They could present their maths puzzle in the form of an advert for their act and so on. 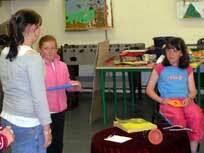 I once set up a maths circus. (It was with younger children of seven to eight years but it could be adapted.) One group presented designs illustrating the fact that a costume made from squares or hexagons might be less embarrassing than one made from octogons! Another group presented facts about mass. They also showed how strong an egg was. Another group were illusionists and demonstrated information about symmetry in an visually imaginative way. Once again it is the "story" that makes it memorable. I wonder if children have ever considered why so many things are grouped in tens? Of course if we had a different number of fingers or toes, say three on each hand, we might count in base 6. Give each group a task sheet to help them describe their environment and themselves. What effects will the differing number of digits have on their lives? What other factors will be important? Extend shared discussion to other subjects for enrichment.